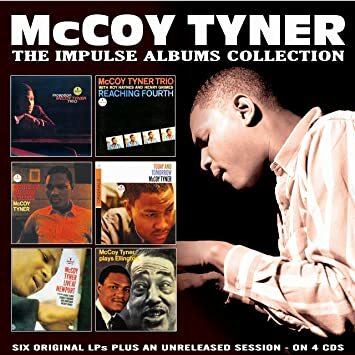 I have been looking at a boxset of McCoy Tyner’s albums originally released on the Impulse label, which have been bundled together on four CDs with an additional live set (which by itself looks extremely interesting). After some research, I have discovered that this set is released on the Enlightenment label (why doesn’t Amazon include label details in the descriptions?). Since I haven’t heard of this label before, I have done further research. It seems these are manufactured in the EU now the material is out of copyright. Some people have not reported any issues with the sound, whereas others (well, one on the Steve Hoffman forum) have indicated that the source may be MP3. Before making a purchase, I’d be keen to know of any experience among other Kabineers of Enlightenment CDs. There are some differing views on the quality of these I don't suppose for casual listening they are all that bad. I personally avoid all these multi albums on a disc as I can't get my head round so much information on a limited space disc haven't been compromised in some way. But I suppose as a get it or miss it then it fills a gap. I did get one of the elmo hope jobs as there was no way I could get the albums individually. They do boogie but not the best but as the material was very old then might not have been their fault. PITA to rip in iTunes too have to edit and chop and change album titles etc. Could have been far worse it might have been a Hallmark Reissue. Thanks for your reply, Jim. I think I'll probably take a punt and see. At this price I can buy it and, if I want to explore further, can hunt out the originals on the Impulse label, albeit at considerably greater expense.